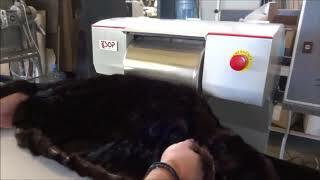 The Ironing-Glazing machine opens the hair and makes the skin and garment appear more dense. It makes the hair more shiny. It is used both for fur skins and for ready-made garments. Electronic speed regulator to use for sensitive areas of the coat. There is no deformation in finished garments. Electronic temperature control. Latest technology electronics allow the most accurate temperature reading. This ensures safety of operation, there is no accidental burning of the coat by the operator. Also It ensures maximum energy saving. The use of PI algorithm from the machines internal computer gives you the maximum output with the least possible energy. The systems provide 20-40% energy saving compared to previous models that did not use electronic temperature control. In addition to this the heating elements work less time and at lower temperatures and so their lifecycle is increased 300%. The cylinder and ball bearings have been re-arranged in a way that most servicing functions will be performed easy. For example a non experienced technician can change the power transmition belt in 5-10 minutes. The whole machine is ergonomically designed so that the user is in better control. Adjustable height 10cm.